Shoe Swap with Chip. Lol. Wallpaper and background images in the Sonic the Hedgehog club tagged: sonic and chip. Weird... I like the picture, but the socks are shown as a part of the shoes, as shown with the shoes on Chip. This means the sock cuffs should be on the socks. 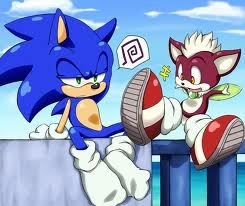 However, Sonic has his own pair of socks, which suggests that he had two pairs of socks. Weird. But a great drawing nonetheless.